I was sitting down for breakfast Friday morning and received an email from my friend Carolyn raving about this carrot ginger soup that she had made for her family the night before. She said I had to try it. Carolyn is an amazing cook, actually so amazing, that she could have her own cooking show. So, when she recommends a recipe to me, I trust that it’s going to be wonderful. I was already planning on making this miso-garlic and tofu salad for lunch and knew this soup would be the perfect compliment. I know what your thinking, carrot soup? How boring!! Well, actually, this soup is not boring at all! It’s rich and creamy (without the cream) with a hint of sweetness. My kids loved it and said I need to definitely make it again. They also said to be sure to make the croutons as well. This is another pantry soup like my creamless tomato soup. If you have a well-stocked pantry then you should have most of the ingredients on hand. The only thing that I had to run out and pick up was the sweet onion. Another thing I love about this soup, is that it’s cream-less and vegetarian. Bonus! 6 cups good quality vegetable stock – I did not have any homemade veggie stock on hand, but I used the boxed variety and it tasted great. 1/2 of a large sweet onion, chopped – these onions are light yellow in color and will be labeled sweet onion at your grocery store. They can also be called vidalia onions. Prep all of your ingredients. Pour 1/4 cup olive oil into a measuring cup. Peel your piece of ginger (to peel your ginger, just take the tip of a spoon and scrape the skin off), chop up your garlic, chop up your onion half and peel and cut up your carrots into 1/2-inch rounds. 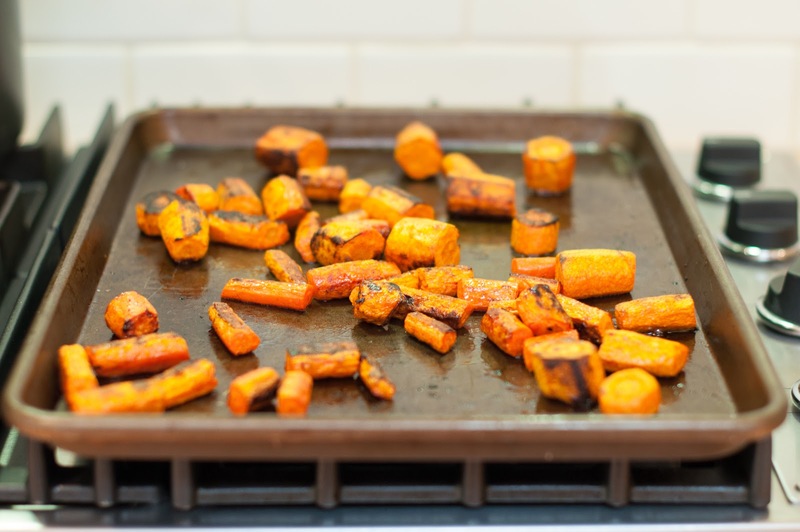 On a rimmed baking sheet, toss the carrots with 2 tablespoons of the olive oil (take this from your 1/4 cup) and sprinkle generously with salt. 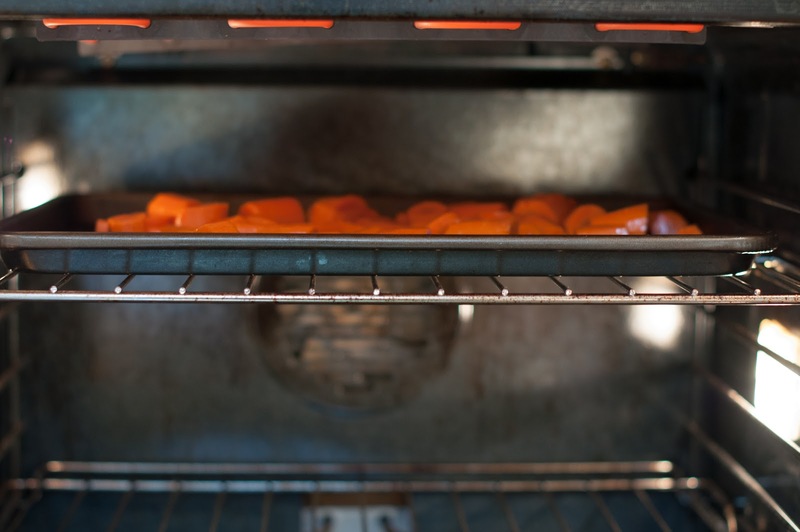 Set an oven rack 6 to 8 inches (I set mine 6 inches from the top) from the heat source and turn on the broiler. Broil the carrots until they brown and soften, turning them over with a pair of tongs or a spatula every 5 minutes or so. This should take about 15-20 minutes. Once your carrots have cooked, set them aside to cool. Meanwhile (while your carrots are cooking), pour your 6 cups of vegetable stock into a medium sized saucepan and bring to a boil. Once the stock has come to a boil, add your piece of ginger and thyme and simmer gently for 15 minutes. When the stock has 12 minutes left to simmer, take the remaining olive oil and heat it up in a dutch oven (or whatever soup pan you normally use) over medium heat. Add the onion and brown it over medium heat, stirring frequently, about 12-15 minutes. Tip: I always start cooking the onions when the stock has 12 minutes left to simmer, that way my onions aren’t done before my stock has finished simmering. See the workstation I set up! So pretty. Don’t be afraid to brown the onion up. It smells and tastes amazing in the soup. Once your onions have browned, add the garlic and let it cook for about a 30 seconds, and then add the carrots. Remove the ginger and thyme from the stock and add the stock to the pot with the onions and carrots. 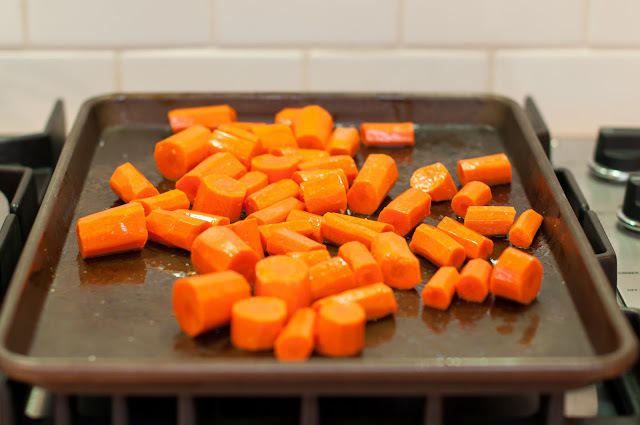 Bring to boil and then simmer for 5 to 10 minutes, until the carrots are soft enough to puree. 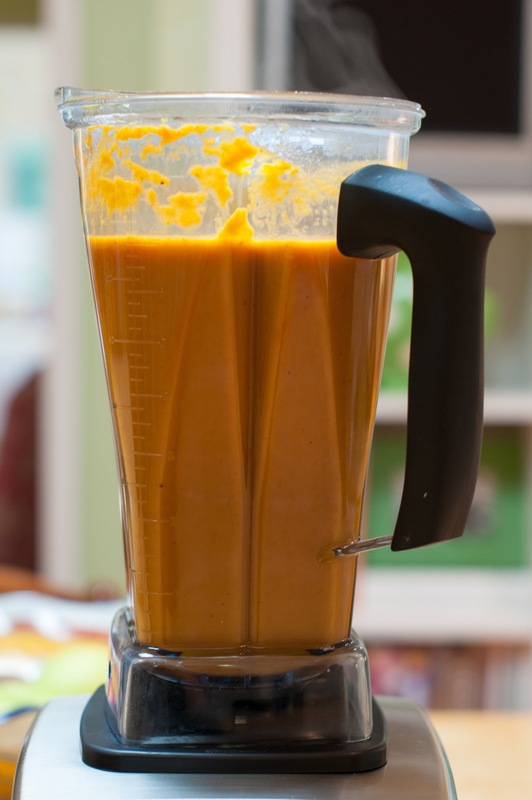 Puree the soup until smooth using either a hand held immersion blender or a standard blender. I usually wipe down the soup pot while the soup is pureeing. Return the pureed soup to the pot. I actually used my vitamix blender here because I wanted a really smooth soup. I was able to pour all the soup into my blender in one batch. If the soup seems too thick (mine was perfect just the way it was), add more stock or water and reheat gently. Add salt and pepper to taste. 2 slices country-style bread, cut into 1/2 inch cubes – I used some leftover ciabatta bread that I had used for panini’s on Monday. 5-6 teaspoons extra-virgin olive oil – or more if you need it, it depends on how big your bread cubes are. 1/4 teaspoon freshly ground pepper – I actually don’t measure out my pepper, I just twist the pepper grinder a few times. Slice your bread into 2 thick slices. It’s really up to you on how thick you want the slices of bread! We like our croutons big, so we slice them pretty thick. Cut the slices into 1/2-inch cubes. In a medium bowl, add the 5-6 teaspoons olive oil, salt and pepper and stir to combine. Toss in the bread cubes and mix with your hands to combine. Make sure to get all of the bread cubes evenly coated with the olive oil mixture.If you have thicker sliced bread like I used, then 6 teaspoons olive oil is perfect. You want to make sure that the bread cubes are all covered. Spread the bread cubes in a single layer on a rimmed baking sheet. Set your timer and bake the croutons for 7 minutes and then check the croutons, if the bottoms are browned, then flip over the croutons and bake for another 6-7 minutes, or until the croutons are browned and crisp. Total baking time for me is usually 14 minutes. The croutons can be stored in an airtight container at room temperature for up to 2 days. Ladle up the soup into individual bowls and top with homemade croutons. The crunchy croutons absorb the flavors of the soup and taste amazing! I have made this twice and it is wonderful !- Thank you. Another great soup! Made this yesterday and thought it was brilliant to roast the carrots! it adds such good flavour. Yaay Astrid! So glad you’re loving the soup and thanks for stopping by and letting me know. I love the combination of the roasted carrots and ginger. It’s really makes the soup have a nice sweet flavor. Ok just re-reading this post now from your current post’s link and the soup sounds great and Not boring at all! 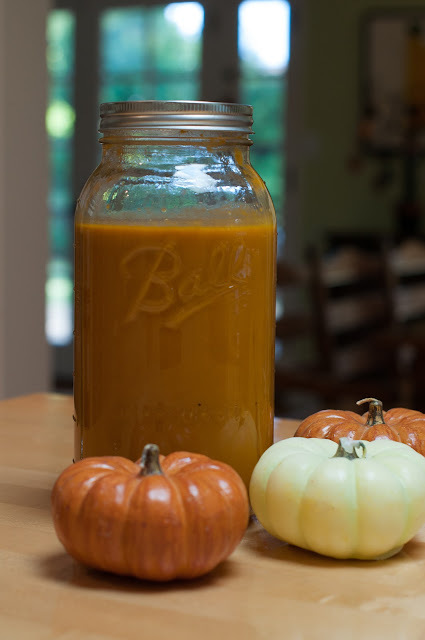 I recently made one w/ roasted carrots, red peppers, and rather than using stock, used coconut milk. I love roasting veggies this time of year! I don’t think its boring now of course, but I use to think it was boring. I think I saw that soup you made and it looked great! I love roasting veggies as well, as it really brings out their flavor. What a beautiful, beautiful soup. Nb, I’ve just lost a good hour trawling through your archives with a cup of tea on a grey morning in London. It’s been blissful distraction. Thank you! Thanks Tori! I hope you found a recipe that you enjoy! LOVE your blog and all your yummy recipes! This looks so amazing…carrot soup ois on eof my all time favorites! Beautiful photo and delicious-sounding soup. I have never had carrot soup but it looks and sounds delicious! I think I’ll be making this sometime soon. Hi Pam! This was my first time as well and I am so glad I gave it a try! I wouldn’t think that carrot soup is boring! Carrot is the only vegetable that my son would only eat when he was going through he started his troublesome two. Good that he is ok with all other vegetables now. I can imagine that my family will enjoy this soup too. I hope your family enjoys the soup. This looks so good…we really love smooth soups around here. I love love love soups with roasted vegetables in them – takes it to a whole new level always! I have a default carrot, sweet potato and coconut soup recipe that I always use … BUT – after the whole amazing tomato soup thingy – you know you are now ‘queen of soup’ in this house … so I’ll definitely need to give this a try! Awwww! So sweet Em. I want the recipe to your carrot, sweet potato and coconut soup. That sounds delish! Is it on your blog? Hi Jacquelyn – This soup looks so delicious and silky smooth! I love the texture and that vibrant orange color. I bet it tastes amazing, especially with the homemade croutons. I’m so glad to have found your blog! Thanks for sharing.